This pan is enough to get even the seasoned chef excited for meatloaf. The perforated, elevated insert allows the grease to drain away as your meatloaf cooks, meaning your meatloaf will be moist, healthy, and delicious. The non-stick coating ensures easy release with effortless cleanup every time and side-less lifting tray makes it easy to remove the meatloaf from the pan for serving. Oven safe to 450°F / 232°C; not intended to be used under the broiler. Sharp-edged utensils and knives should not be used. BAKE HEALTHIER MEATLOAF: The perforations in the baking rack drain fat and grease for healthier meatloaf; side-less lifting tray creates easy serving with mess-free slicing. NON-STICK COATING: This meatloaf pan set is silicone based and has a non-stick coating for ease of baking and clean up. 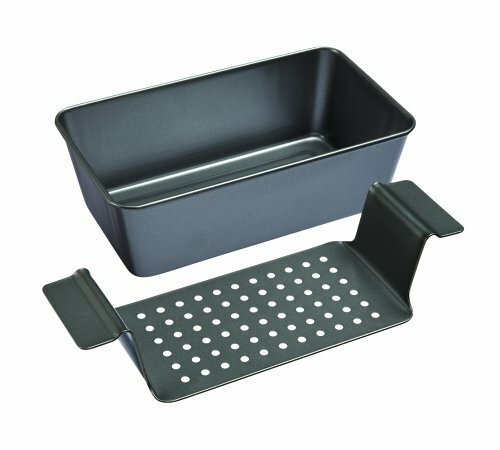 LIFTER INCLUDED WITH PAN: This 2 pound non-stick meatloaf pan comes with a perforated elevated lifter.